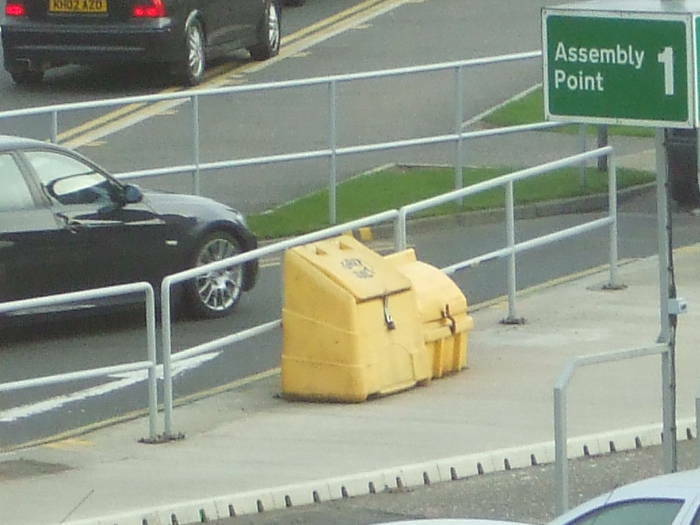 Anywhere you go in Britain, you encounter these strange public boxes that mystify the visitor. Well, at least they mystify me a little. Of course I know what they are — large boxes labeled GRIT are very obviously Grit Boxes. 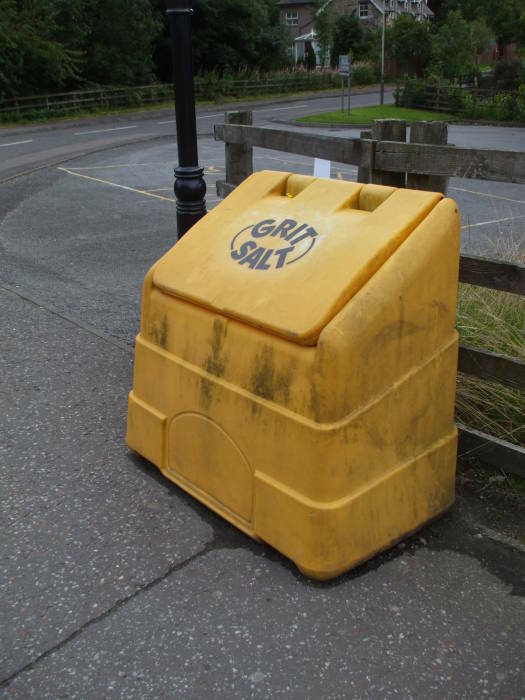 Some go so far as to specify that they also contain SALT, although they are still referred to simply as Grit Boxes. For example, here is a clearly labeled example in Pitlochry, in the southeastern Lower Highlands in Scotland. A curious passerby can verify that, yes, they contain grit and salt. But close the lid when you're done examining the contents! You don't want the supply of grit and salt to turn into one large gritty rock-like block of salt. Presumably anyone passing by and finding themself needing, or just wanting, a heaping handful of gritty salt (or salty grit) can help themself. This suggests a much greater public demand for readily available grit than I would have expected. Now, it might be overly ambitious to attempt to document The Grit Boxes of Britain, as that would need detail on the grit boxes of England, Wales and Scotland, and from what I've seen that might be rather overwhelming. The Grit Boxes of the United Kingdom would be even worse as it would also need to cover the grit boxes of Northern Ireland and the Channel Islands. 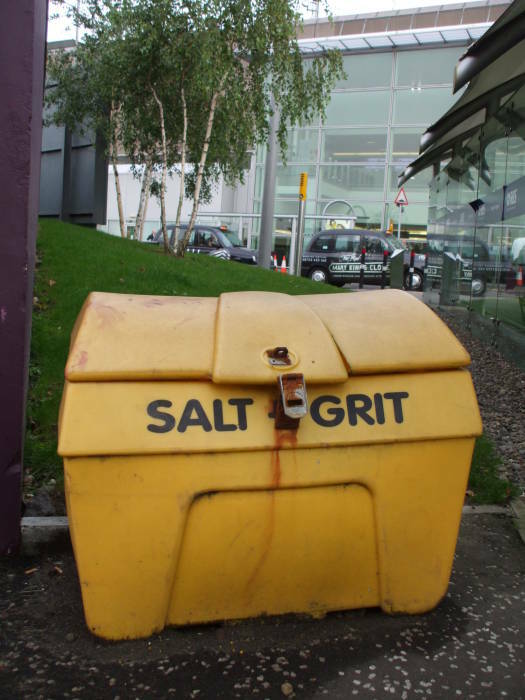 I don't even know if there are grit boxes in the Channel Islands! 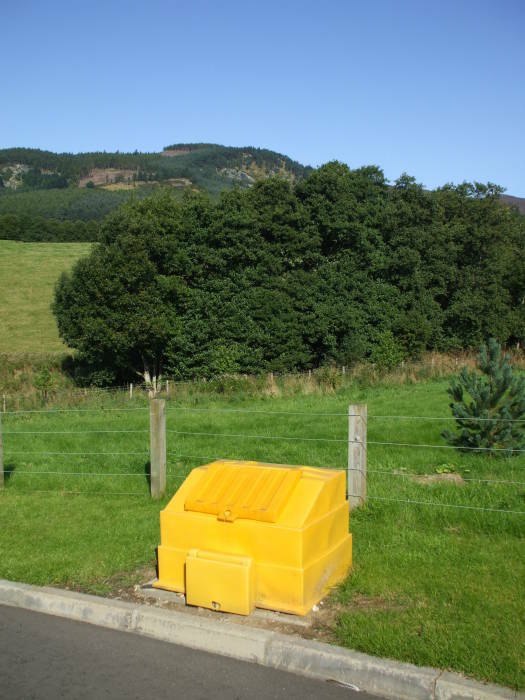 So here is just a small sample of the range of grit boxes that can be found in Scotland. And by the way, if this sort of overly detailed catalogue of infrastructure appeals to you for some reason, then you might also enjoy my Toilets of the World collection, since that is the very nonsense off of which this page spun. Or perhaps you would prefer a pictorial catalogue of Roadside Greek Orthodox Shrines. While I was delighted to find that some of the people on the singletrackworld.com forum realized that this page was not claiming to display all that is worthwhile to see in the Land of the Thistle, I was sorry to see that others in said forum took it as literally as those who would claim that Oliver Cromwell did not invent the ancient martial art of Crom-Fu after all those years he obviously spent living and studying in the Middle East, and beyond that, pedantically explain that Tasmanian is not really a distinct language unto itself and other pointless rebuttals to and clarifications of my nonsense. Back to the grit boxes. Some are on the edge of smaller towns, like the example above in Pitlochry. Some, however, are found in the country. 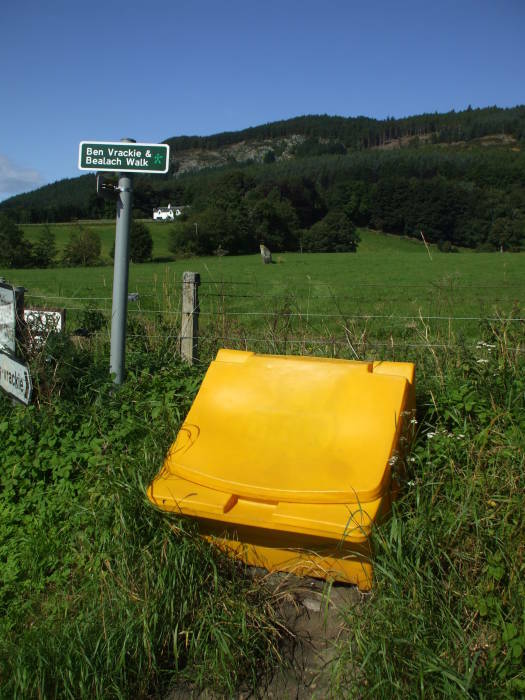 The first example below is along the A924 road between Pitlochry and the village of Moulin. They can be found in small villages. This rather gritty example above is in the small village of Moulin. But then you don't have to get out into the country to find grit boxes. You don't have to go very far at all. 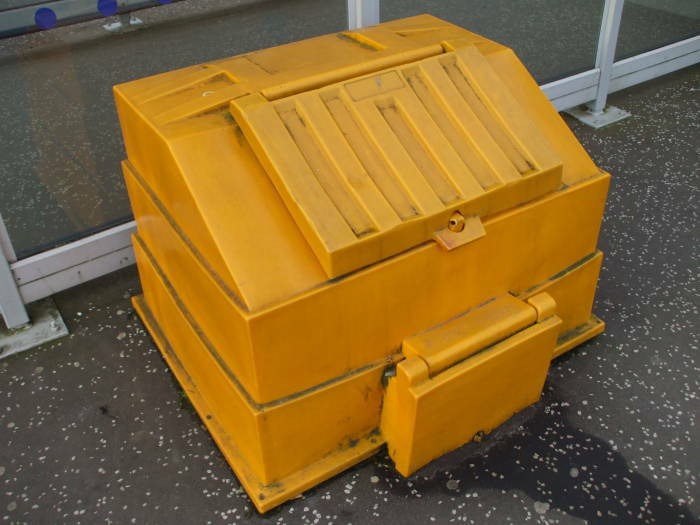 Here is a grit box just outside the main terminal of the Edinburgh Airport. It's a sad commentary on the decline of society when the grit boxes must be locked. 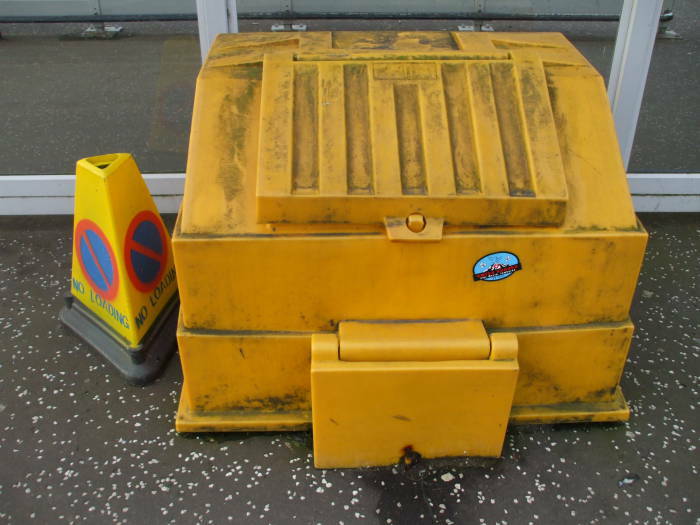 Here is a secured grit box in Edinburgh. 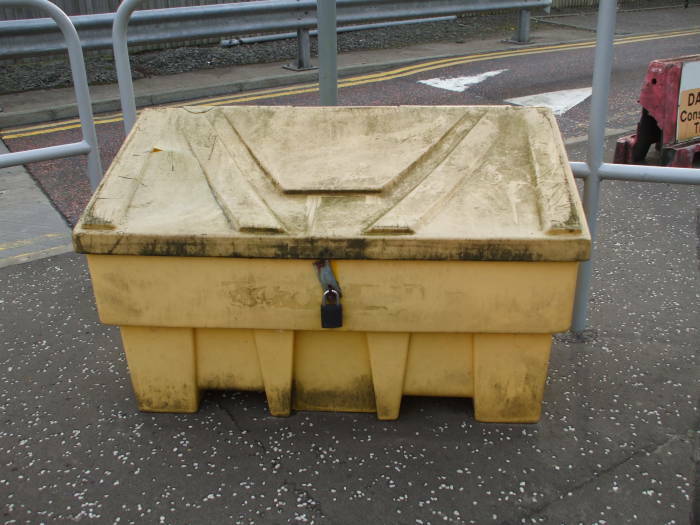 But happily, Edinburgh still has unlocked and freely accessible grit boxes. Some of them have associated warning cones, but that is just another safety measure in addition to the jaunty bright yellow color of today's modern grit box. 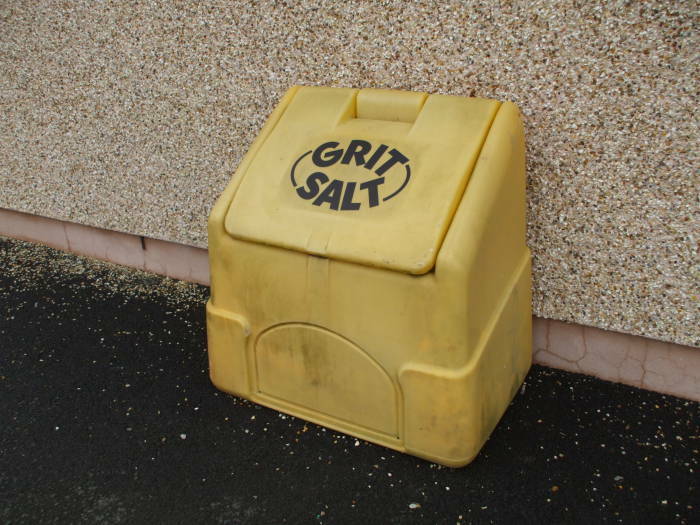 Yes, the earlier grit boxes which one may see in frequently in England may be made of concrete. But those I saw in Scotland were almost all bright yellow. See above for a discussion of the difficulty of documenting British Grit Boxes in general, let alone Grit Boxes of the United Kingdom. 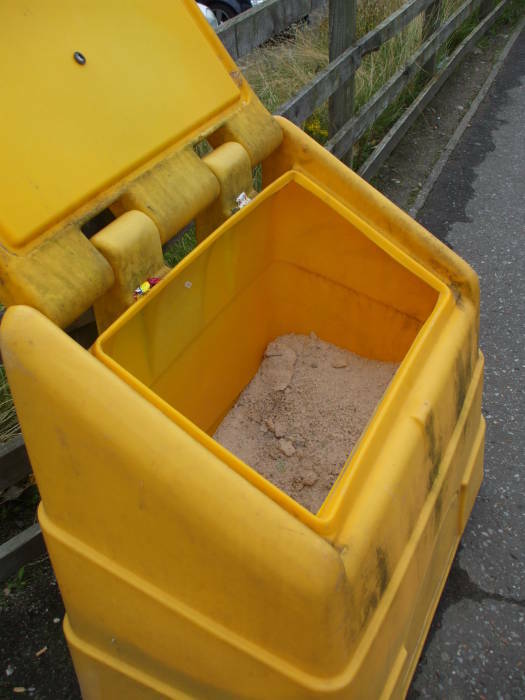 Some times you find such a high-grit situation that the grit boxes appear in pairs, as in this example in Edinburgh in the first picture below. Moving from Edinburgh, in the south of Scotland, all the way to Stromness in the Orkney Islands, you find a common theme to the grit boxes. The above example is at the ferry terminal in Stromness, on the main island of Mainland in the Orkneys. 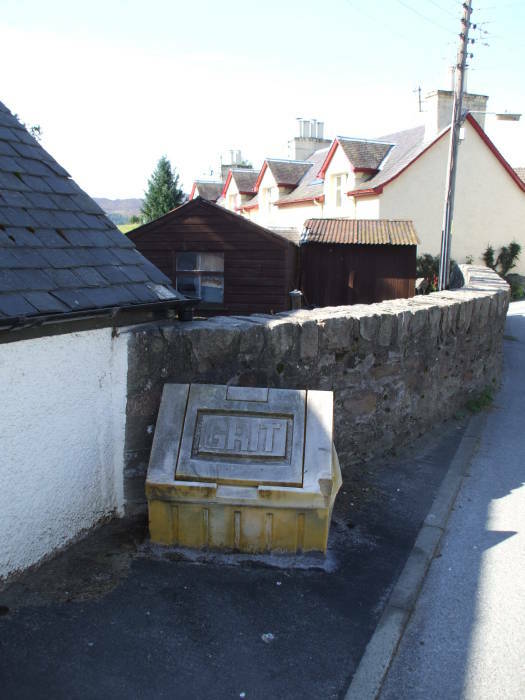 This apparently ecclesiastical grit box might be associated with the Pitlochry Church of Scotland. 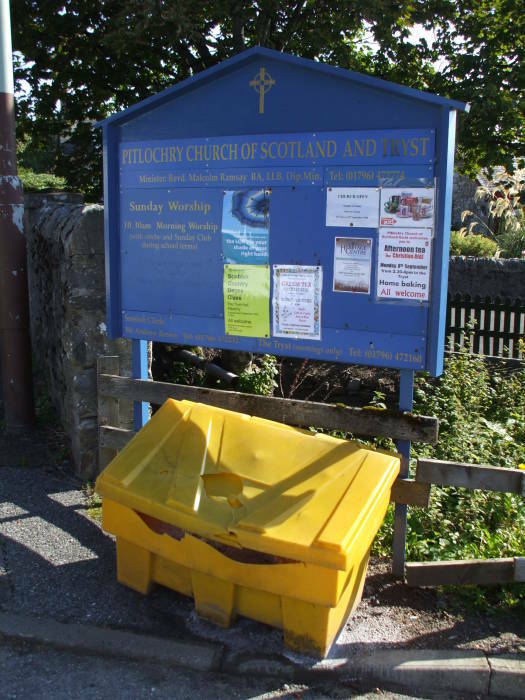 Or maybe the entrance to the church was just a convenient place to locate a grit box. There's a nice hike from Pitlochry up over the pass between Meall Uaine and Meall na h-Aodainn Moire and then down to Killiecrankie. It's about 500 meter elevation gain to the pass, and about 17 kilometers out and back. As you start up into the hills you pass an isolated standing stone called The Dane's Stone around British Grid location NN 942 594. If you need any grit for your trek, a conveniently located grit box is available. See The Dane's Stone in the center of the pasture behind the grit box. And speaking of megalithic grit boxes, here is another example on the path to the Maes Howe Neolithic chamber tomb in the Orkney Islands. I really don't know why anyone would need grit as they were walking along the path toward this World Heritage site, but then I'm rather vague on the whole point of grit boxes anyway. 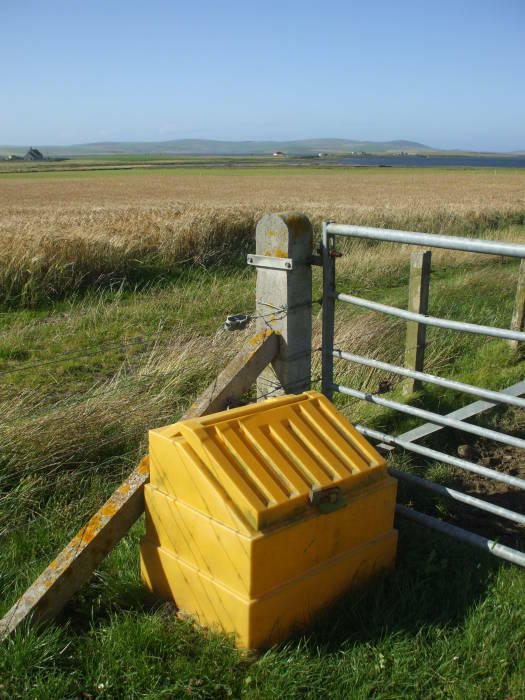 Beyond the barley field behind this grit box are the Neolithic sites of the Standing Stones of Stennis (a partial stone circle), the Barnhouse Neolithic village, the isolated Watch Stone standing stone, and the large and fairly complete Ring of Brodgar with its henge, circle of standing stones, and associated cairns, tumuli, and isolated standing stones. See my megalithic travel page if you're into these prehistoric details. Maes Howe is the only feature of this Neolithic complex with its own grit box. Finally, sometimes grit boxes take on new identities. 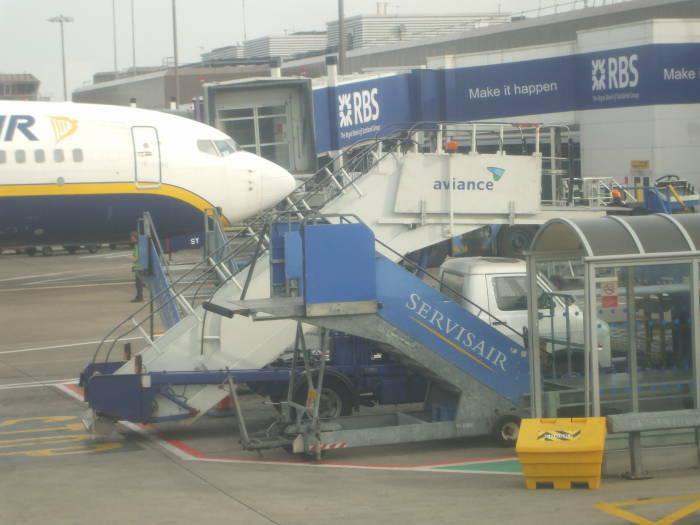 Here is what appears to be an ordinary grit box on the tarmac at Edinburgh Airport. But look closely — it's no longer an ordinary grit box! 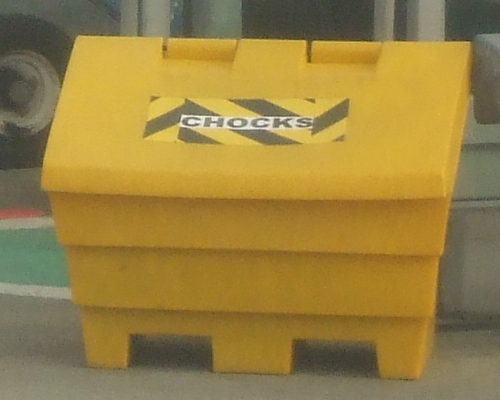 It has become a Chox Box, storing those wedge-shaped rubber aircraft immobilizers!